Description: 442 p., 23.5 cm. with B/W photos of many bootleg albums & CD's. Notes: A detailed history of the popular music bootleg recording industry, from the first bootleg Dylan album (Great White Wonder) in 1969 until July 1994. Contains many interviews of insiders in the industry, including many who produced Dylan boots. Chronicles the evolution of international laws targeting the illicit trade, and reviews the content and importance of many boots of artists such as Dylan, the Beatles, Stones, Led Zeppelin, Springsteen, and many others. 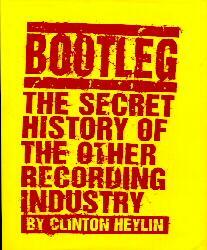 Includes a glossary, Heylin's list of the top 100 boots for 60 different artists, a bibliography, notes, and index. Essential for anyone who wants to find out about this underground industry. This book was first published in the UK as The Great White Wonders: A History of Rock Bootlegs (image on the left), where it won the Record Collector award for Best Book of the Year. Review: David Fricke, of Rolling Stone magazine: "...highly entertaining" Peter Doggett of Record Collector magazine: "...a fresh perspective" and "...it's a damn good read." Hot Wacks: "...if you're interested in bootlegs, you'll enjoy this book."